Before I explain the promotion, let me tell you a story. A few years ago, Mike and I received a frantic call from our babysitter. After she put Dylan to bed, she heard him through the baby monitor saying, “I can’t breathe, can’t breathe, darkness creeping in. Can’t breathe, walls closing in around me. 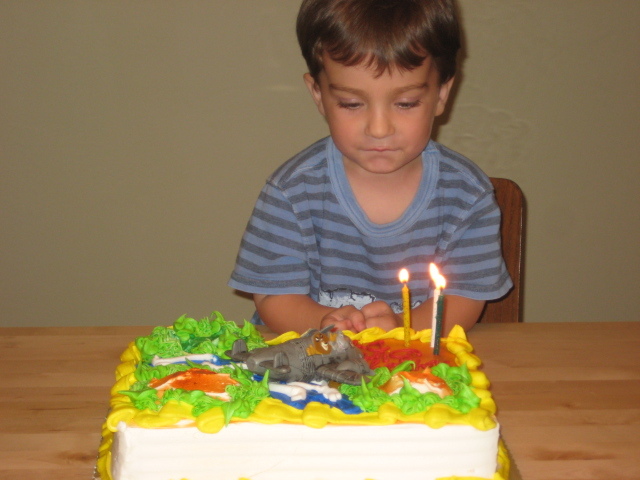 So alone, so alone.” After we stopped laughing, we explained to her that Dylan wasn’t hallucinating; rather, he was performing a monologue from his favorite movie, “Madagascar.” It was from the scene where Alex, the lion, is stuck in a crate en route to Madagascar. 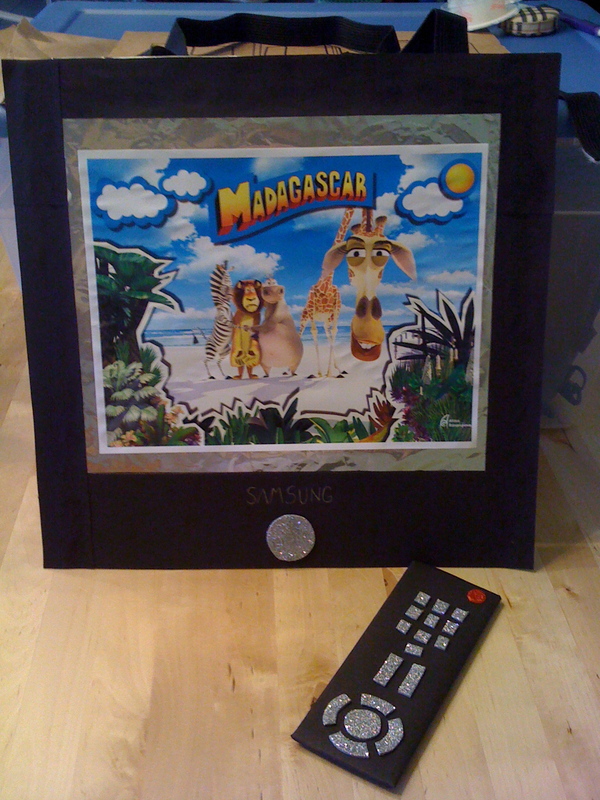 A flat screen television and remote control showing the movie! I was particularly proud of this costume (check out the craftsmanship on the remote control! ), and when Dylan refused to wear it (and after I finished weeping from his disapproval), I wore it myself. 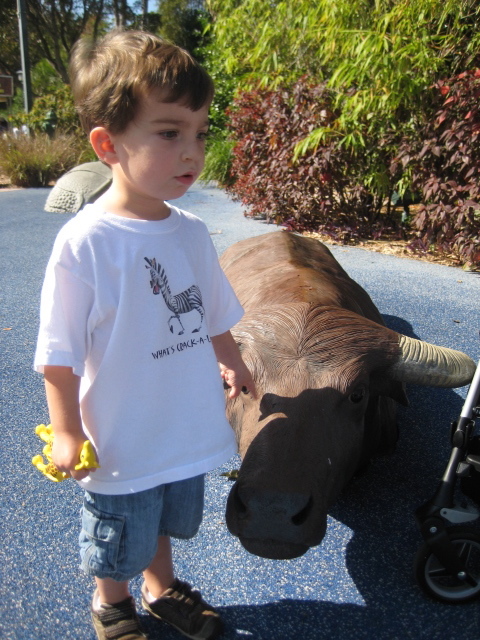 Shortly after Dylan’s birthday, we visited the Miami Zoo and saw Alex, Marty, Gloria, and Melman in the flesh! Notice Dylan’s t-shirt. In our family, we go hard or we go home. These days, “Madagascar” and “Madagascar: Escape 2 Africa” play on a continuous loop (between “Cars 2” and “Star Wars: The Clone Wars”) on our DVD player. Riley is catching up nicely, which is a good thing, because “Madagascar 3: Europe’s Most Wanted” will be in theaters in June. 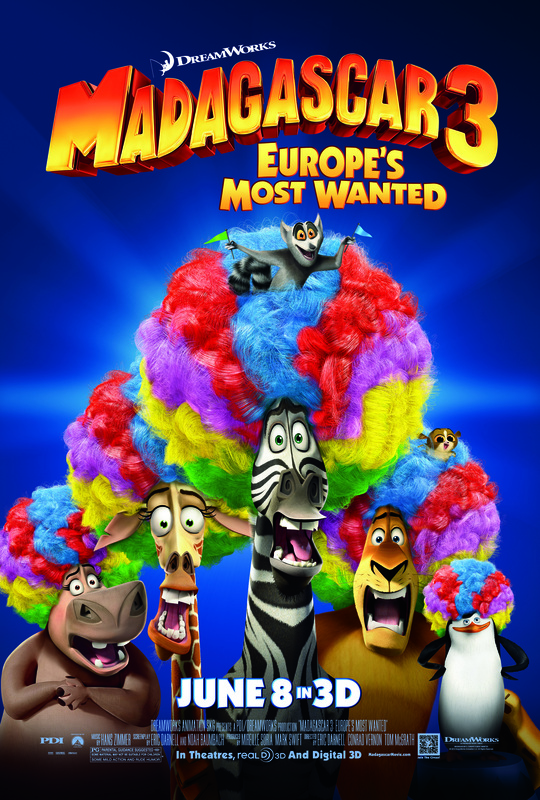 Ten lucky SOUTH FLORIDA readers have the chance to win passes to an advanced screening of “Madagascar 3: Europe’s Most Wanted” on Saturday, June 2nd at 10:30 a.m. at either the AMC Sunset Place in South Miami or the Cinemark Paradise in Davie. The deadline to enter is midnight on Friday, May 25th. After that, I’ll choose 10 winners at random. Good luck! 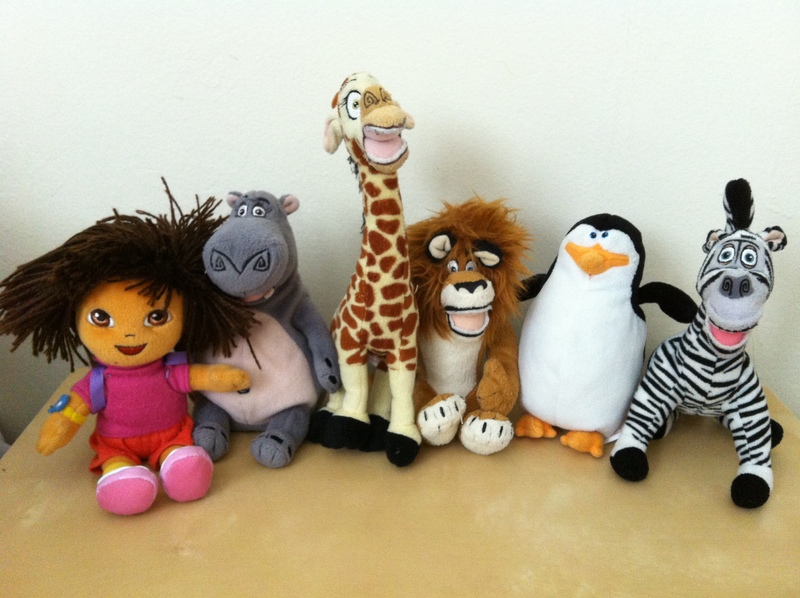 If I were more of a Madagascar fan……..but what a cool giveaway!!!! Gotta love our boys for becoming obsessed with something and NEVER getting over it! Therefor we, the moms, become obsessed with the movie and buying all the characters and toys that go along with it!! I think all the characters in the movie are so cute and hilarious…can’t wait to see what they come up with for this movie! Loooooove to see that we nailed D’s birthday present that year! Sophia was obsessed with Cinderella and Dylan with Madagascar. At least we know that they have the ability to focus, right?!?!? Madagascar 2 is in the DVD player right now and Sage keeps having me start it over from the beginning every time I walk in the room. Looks like he is taking a page out of Dylan’s book! I like ’em big, I like ’em chunky!